NEBOSH (National Examination Board in Occupational Safety and Health) was formed in 1979 as an independent examining board and awarding body with charitable status. Offering a comprehensive range of globally-recognised, vocationally related qualifications designed to meet the health, safety, environmental and risk management needs of all places of work in both the private and public sectors. The qualifications are recognised by the relevant professional membership bodies including the Institution of Occupational Safety and Health (IOSH), the International Institute of Risk and Safety Management (IIRSM) and the Chartered Institution of Water and Environmental Management (CIWEM). NEBOSH technical standards are overseen by a Qualification and Technical Council with representatives drawn from national institutions. NEBOSH is an awarding body approved by Scottish Qualifications Authority (SQA) Accreditation, which has a UK-wide regulatory remit. NEBOSH maintains Investors in People (IIP) status and is also an ISO 9001:2008 registered organisation. There are three categories of NEBOSH qualification - Award, Certificate and Diploma. An Award demonstrates an understanding of the subject covered and may be used as an introduction to other higher level NEBOSH qualifications. Diploma level qualifications demonstrate professional knowledge of the subject covered. Choose your own career path in safety that suits you. 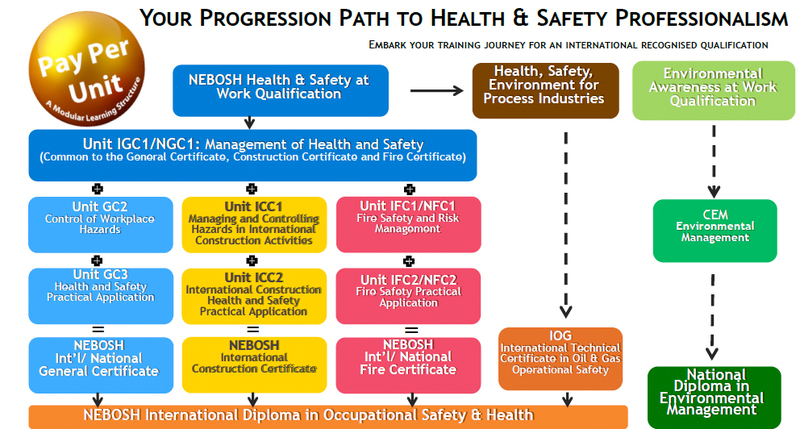 For NEBOSH IGC1 is the core element and on completion candidates can progress and obtain either the General, Fire or Construction NEBOSH Certificate by completing other units; or specialise in Oil and Gas or Environmental courses. Choose what you want to learn and then choose how you want to with our full time or part-time taught, distance, e-learning or blended options. Fully accredited and globally recognised safety management courses from NEBOSH, IOSH and other Internationally recognised bodies to give you the competitive edge as a safety professional.